A tale for children of all ages FROM 9 TO 99. Treeb is a working bee who spends his days supplying the hive with nectar to make into honey. For generations, the queen bees cautioned the bees to never fly over a border called the Forbidden Forest. The bees that cross it never return and nobody knows why. Despite the warnings, Treeb decides one day to fly through the Forbidden Forest in search of the Sacred Forest, a beautiful place filled with flowers. When Treeb discovers the land outside of his home is barren he becomes famished. But everything changes when he is rescued by a family and embarks on a mission to prevent the reset of the world. Accompanied by wizards and other humans and animals, Treeb’s adventure takes the group to eight gates that each must use a special talent to enter. Will the team make it to the Sacred Forest in time to save the world? In this charming tale, a bee recruit’s a band of characters to help him on a dangerous quest to prevent the reset of the world. Note: Treeb is pronounced "treebee." We plant a tree for every book SOLD! 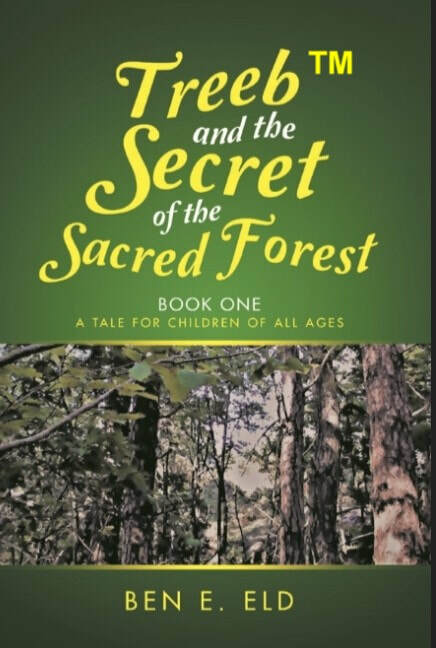 Get your copy of "Treeb and the Secret of the Sacred Forest, Book One," Book Two and Book Three of the story are slated for release in the summer and fall of 2019, respectively. About the author: Storyteller by nature, Ben E Eld, was born in 1947 in Sweden. He has been fortunate to explore various places around the world meeting people from all walks of life. Ben’s journey has included a career in agriculture, entertainment and the hospitality business. His path has led him to the desire to help restore the ecological balance the way he knows; sharing stories. Ben currently resides in Orlando, Florida near his son and granddaughter. The writing of the book is inspired by Ben’s interest in the preservation of bees and the need for reforestation. Albert Einstein was once quoted “If all bees are destroyed, the human race will be extinct in four years.” Most people are unaware of the fact that bees are responsible for close to ninety percent of the food we consume daily. The world oxygen levels are declining and air pollution is causing health problem across the ecological spectrum. “Treeb and the Secret of the Sacred Forest” is intended as entertaining education addressing this issue. Bee preservation must be addressed now, to secure the food supply for this generation of humans and for the future of mankind. World forests are responsible for the production of fifty percent of the air we breath and the cutting down of the forests are partly responsible for the world wide oxygen decline. The good news is that a gentleman from India who worked as an engineer in Japan building cars, observed an elderly man planting a small forest inside the manufacturing plant to improve the indoor oxygen levels. Being an engineer and having a piece of land behind his house, the man begun researching and analyzing soil samples as well as study plant and trees related to the particular soil on his property. The name of this gentleman is Shubhendu Sharma and he is the founder of Afforestt ECS Pvt. Ltd., (www.afforestt.com) his work has led to growing forests at an accelerated pace and forests are now growing up to be self sufficient in three years, compared to thirty years or more that has been the norm up till now. It is now possible to solve the reforestation problem in one human lifetime. Published by D.b.a. Aurora Publishing Co.